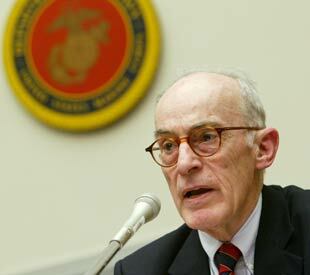 Retired Lieutenant General William Odom was the director of the National Security Agency between 1985 and 1988. Currently a senior fellow at the Hudson Institute and a professor at Yale University, Odom has been an outspoken critic of the Bush administration’s foreign policy. You’ve described Iraq as the greatest strategic mistake that the United States has ever made. Could you elaborate on that? A shorthand way is to reflect on what happened to the Hapsburg Empire. There is an analogy here with bin Laden and 9/11 and his taking refuge in Afghanistan. I think invading Afghanistan made some sense because we were going after the culprit. But when we went into Iraq, we were invading a country that didn’t have anything to do with 9/11. This has set in motion some of the same kind of consequences that the Hapsburgs set in motion by their ultimatum to Serbia, which started World War I and led to their own destruction. Rather than losing the United States as an empire, what we’re doing is losing Europe. In other words, we’re essentially destroying NATO. And NATO has provided a supra-national-political-military substitute for government in Europe, which has allowed the longest period of peace and prosperity in the history of Europe. Whether that can continue without NATO or without a strong U.S.-European connection through formal institutions is most doubtful. Absolutely, but what we are destroying is not a territorial empire, it is an ideological empire. The ideology’s not democracy; it’s liberalism with a capital L. Liberal countries are countries that have constitutions. They brought the state under control. They limit the power of the state, they make it the honest referee. Those countries have always become democratic in their decision-making procedures, but countries that become democratic without first having a solid constitutional agreement almost never turn out to be liberal. Remember that in the fall of 2001, the U.S. had over 90 countries participating in five sub-coalitions in the anti-terrorism coalition. We never have had so much international support in our history. And we had NATO, without any urging, invoking Article 5 of the treaty saying that bin Laden’s attack on the United States was an attack on them. They didn’t sign up for that, and they weren’t even asked. And then the president marches on, acting as if Europeans were fools because they didn’t sign up for the war, as if they were out of place to question whether they should even be consulted. A lot of people have talked about the reasons why we made the mistake of going into Vietnam. It’s harder to get a handle on why we made the mistake in Iraq. How do we find out what the reasons were? Only thing we could do is ask Mr. Bush. It seems to me that it’s pretty hard to imagine us going into Iraq without the strong lobbying efforts from AIPAC [American Israeli Public Affairs Committee] and the neocons, who think they know what’s good for Israel more than Israel knows. The invisible elephant in the room on this issue is the Israeli factor. People don’t like to talk about it. Now that we’re in there, we’re getting to realize that the war is creating far more dangers for Israeli security than it’s provided improvements for Israeli security. I think you’re going to see a Shiite Islamic regime in at least a large part of Iraq and it’s going to cooperate with Iran, and Iran with Hezbollah in Lebanon, and that will create all kinds of trouble for Israel. It’s a lot of hubris, a lot of intellectual arrogance, on the part of neocons who think they know what’s better for everybody else. I remember that James Graham, who was the CIA’s Asia guy, also argued against the war until Kissinger finally forced him out. So, the agency wasn’t on board for that war either. To blame the intelligence community is a big mistake. Intelligence communities are not free. They’re hired agents for a particular administration, which picks their leaders. Take this analogy from the corporate world: Have you ever heard of a board of directors firing a vice president for marketing? No, corporate boards fire the CEO because it’s the CEO’s job to hire the vice president for marketing. So if the Congress is so upset with the CIA’s performance on the war, they should impeach the president. The Iraq issue will come back because it’s just going to get worse. The administration may find some cover to cut and run. I would not be surprised to see in a few months, when the Shiites are pretty well ensconced in the government, they may just say it’s time for you fellas to leave. It would be great in the sense of not staying longer, but then we would be facing the strategic ramifications for Iraq and the region, which we are going to have to face sooner or later anyways. And that is that we have actually put in the driver’s seat a country whom we have defined arbitrarily as one of our worst enemies, Iran. There is a knee-jerk tendency to say, “Well, if we left, it would be a mess. Therefore, we can’t leave.” That requires blinding oneself to the fact—the reality—that our presence is creating the mess, that we don’t keep a mess from happening by staying, and that we don’t have the alternative of not creating a mess. When we crossed the border of Iraq with the invasion, all these untoward outcomes were inexorably going to happen. It’s not anything particularly brilliant on my part. We have all been made to put up with this preposterous illusion. It’s like somebody telling you, “There’s no cloud in the sky today.” And when you look up and can’t see the sun, you say, “You know, I don’t see the sun.” It doesn’t take a lot of insight to point out that there’s no sunshine up there. The sad thing to me in that regard is that the Democrats gave the public virtually no real choice in the last election. So I’m not terribly surprised at the way it came out, but I don’t think it really reflects where the public stands on the war in Iraq. I’ve given up on the Democrats. I think the best hope right now, for the next election, is to find a Republican who will say that the war is a mistake strategically and then get out. I would have, in the past, said it’s almost too ridiculous to take seriously. But given this administration’s record, I’m reluctant to rule it out. You can look at this and make a very strong case that by naming the “Axis of Evil” and invading Iraq, we have actually strengthened North Korea and strengthened Iran. They’ll both end up with nuclear weapons, whereas they might not have if we hadn’t done this. If you had a good reason to invade Iraq, and I don’t think we did, you shouldn’t have lumped Iraq together with Iran as enemies until after you had achieved what you wanted to achieve in Iraq. Surely you don’t want two enemies out there. Why not have Iraq’s other enemy, Iran, on your side?